Not Diabetes: Window Seat Cushion. Things I can’t do: make insulin. Things I can do: make a window seat in less than ten minutes. The Other Two Behave Themselves. What a lovely, relaxing setting. Thanks for posting the video – I know what I’m doing next week during my staycation! I’ve got the fabric and the staple gun but had no idea where to go from there. That video made it so easy. 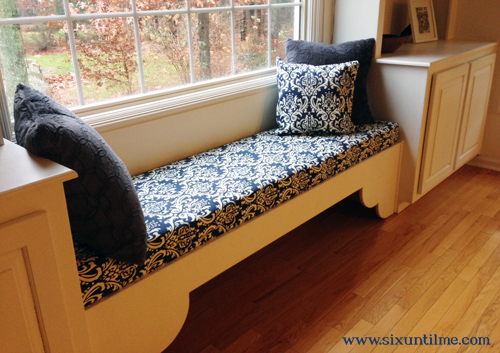 Proof of said easiness is the fact that I actually made a window seat cushion without stapling my hand to my face. Absolutely beautiful! I’m ready to curl up with a book on that seat right now. Kerri, you did very well. It looks lovely! and I definitely understand not wanting to waste that good prick. Very happy you didn’t have any accidents with the staple gun. every time I see and prick my fingers I think of all my D friends and how hard it has to be to have achy fingers all the time! Oh so pretty!!!! I just want to curl up there with a big book and a bigger cup of coffee (or glass of wine(. This is so lovely and definitely makes me want to start doing some more needle felting, it would look so lovely on my bed. I recently made a pom pom cushion and really enjoyed it so maybe all the cushions on my bed will have to be homemade.